I moved to Vienna for business with an expectation to stay for a year or two. In search for the perfect serviced apartment, I looked at multiple solutions across multiple districts. The difference between the different districts is very apparent and one should select the one that suites their needs. The 7th district is up and coming and I think is the most beautiful vibrant one in Vienna these days. Its steps away from a pedestrian high-street filled with shops, has wonderful cafes and restaurants as well as all basic needs such as banks, pharmacies etc. Most all service apartments that I have seen where similarly managed and looked similar in the form of relative ‘cold’ look and feel. The change was when I met Isabelle and later Karina. The Monscheingasse was immediately my selection for multiple reasons. The apartments are top notch. No exception. Small but beautifully designed and appointed for all the comfort needed. The team is great and responsive, kind. They make you feel like home! 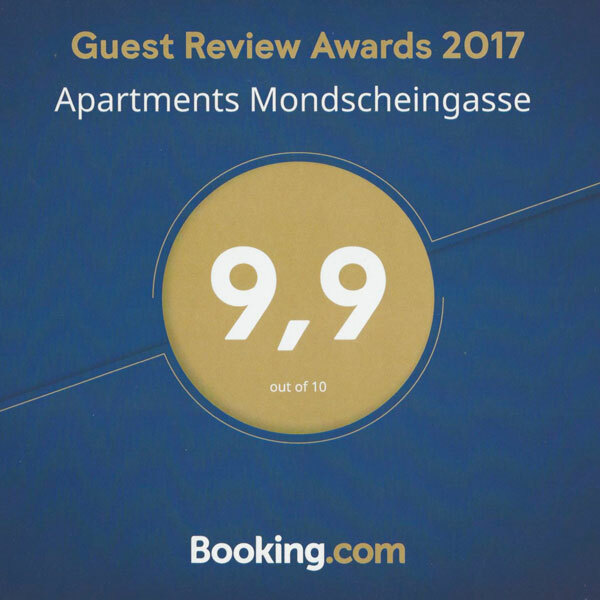 I would not hesitate telling anyone who is in search for a serviced apartment in Vienna, that it would be a mistake to make a selection before seeing this one. Clean and modern apartment. Great location close to public transportation. Convenient for walking to most attractions. Very quiet street and very responsive host. Beautiful apartment within walking distance of the 1st district. We enjoyed the quietness. No street/city noise. Quiet neighbors. Very peaceful and relaxing. The furnishings are modern new and classy. We would definitely return! Loved the place. Quiet, modern, in a great neighborhood that’s close enough to tourist sites but much more local. Isabelle made the check-in process very smooth, giving us all the details beforehand, facilitating key transfer, and leaving us a package of goodies. Will definitely stay again! This was a wonderful place to stay and Isabelle (although I never met her) was a terrific host! The apartment was clean and spacious with some special treats for my friend and I! I certainly recommend staying here! Very nice, modern and cosy flat in the very very heart of Vienna. Isabelle was so helpful and punctual with all the details. It was a real pleasure to stay there. Perfect for couples looking for privacy. It is very quite as window looking to the inner side, no single noise from the street was heard. I would definately come more and more times.